Harry Potter and your computer - is a free program for the games about the world of Harry Potter. It solves some problems of games and can automatically perform some configuration for games. You can download the program from the page "Files"
The program is designed to test the basic features of the computer and determine the possibility of the launch games on it for our theme. It also solves some known problems playing games or just to help you do something that requires some computer experience. 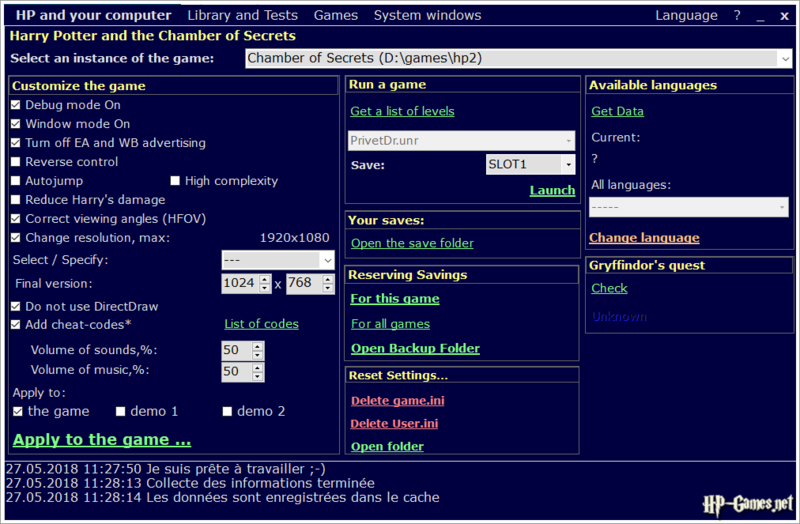 For example: to enable debug mode in the first games, or make "Goblet of Fire" was launched in the resolution of 1920x1080 pixels (800x600 initially without the possibility of choice). The list of functions and features vary from version to version, and are listed below. It is understood that all the games and the drivers have already been installed. "Deathly Hallows. Parts 1 and 2 "
"LEGO Harry Potter: 1-4 years"
"LEGO Harry Potter: 5-7 years"
* These games have a very strange system of saving: for each language version, a separate folder for saving is created. Therefore, our program supports only those languages, information about which we were able to verify games have long been out of sale, but their distribution model also did not allow access to all language versions of the game, since the principle of regional distribution was used. After enabling the debug mode the game stopped running. Answer: delete the configuration files (hp.ini, game.ini, hppoa.ini, user.ini to save the folder), restart the game and to enable debug mode without the help of the program. The Philosopher's Stone Quidditch blocked. Answer: use a check box to unlock Quidditch program or edit the configuration file manually. The screen resolution in "Goblet of Fire" is not changed. Answer: for each new screen resolution creates a new executable file. Therefore, it is better to make a separate label. Deathly Hallows. The program creates a file to modify the registry. The user himself decides - to use the file or not. The contents of the file can be viewed in any text editor. ЛЕГО LEGO Harry Potter: 1-4 years. Amendments are made to the hidden developers configuration file (to solve the Dark Tower), as well as in the service file for the game Steam-version (language switching). In case of damage to the latter request is sufficient to check the Steam client files: corrupted file is automatically overwritten. Open the archive using the archiver. Extract the folder from the archive on a disk with games (preferably not the C drive). 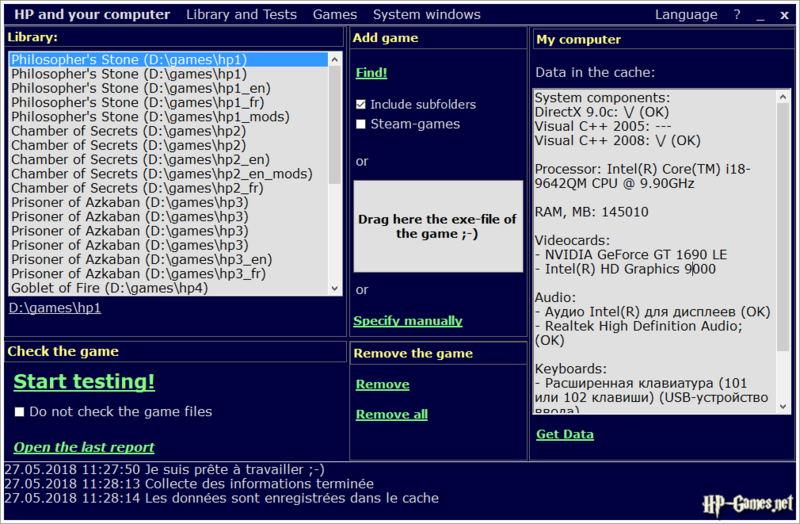 Run the program and add games to the library. If the program does not start - install .NetFramework 4.0. Program was tested 66 antivirus software (view report). May cause false positives from anti-virus 360/Cylance. The program does not distribute any advertising or malicious modules. Information about third-party development is given in the "About". The program is distributed on Freeware and principles "as is" - the developer is not responsible for any damage caused by using the program. The program is allowed to publish on other sites under 2 conditions: no decompilation and code changes or resources; notify us that you publish on its website a program in the subject «Organizational matters». The authors of this software will not respond to questions about the program, if it was downloaded from another site, it something has been changed (practice Reproduction of material there for a long time. Therefore, we can not guarantee that the owner of the site, reproduced, republished anything with our site, has not made it into something bad things). P.S. If you have any suggestions about additional features - specify them in the comments. It may be some action with the game and its files, and actions for the implementation of which you do not have enough knowledge, experience, or just a little afraid of - nothing to break, and it is better to entrust the program (although the program sometimes break something better people :-) ). P.P.S. This article may contain errors. You can help us with the error correction. Addresses to communicate with the administration on this page: https://hp-games.net/about-en. он мне выдает ошибку. «Ссылка на объект не указывает на экземпляр объекта.» Как бы не пыталась ему указать расположение, ни чего не выходит. до этого запускала так же 1 и 2 части все было ок. Привет) Как показывает практика, программа не принимает игры из антологий, где изменена структура некоторых файлов игры. При этом она там не особо придирается. А окошко настроек сильно обижается, когда его вызывают при пустом списке для данной игры (ибо нет ни одного экземпляра, а в роли объекта выступает игра). Вывод: у вас может быть испорчена именно третья игра, так как с копиями официальных сборок программа дружит. Та же ошибка с UGameEngine::Init < — InitEngine, только игра у меня установлена на диск "D", в несистемную папку. Версия от R.G.Catalyst. От модератора: движок игры не любит пробелы и кириллицу в пути. Сделайте путь вида D:\games\hp2 (только латинские символы и без пробелов). Спасибо, никогда бы не подумал, но убрал все пробелы (игра сама создала при установке папку, название, разумеется, с пробелами было) и заработало. Только вот в меню настроек почему-то проседает аж до 12 ФПС, хотя так стабильно 60. Мне кажется это попадалось где-то, но сейчас уже не помню где. Не могли бы и с этим помочь или хотя бы подсказать где прочесть? От модератора: движок там весьма избирательно придирается к путям из-за ряда проблем в Windows и базовом языке, которые имели место во время создания той версии этого самого движка. Поэтому приходится учитывать этот момент. Насчёт кадровой частоты в меню — вариантов решения не попадалось, да и просадка у нас не наблюдалась обычно. Ну ладно, всё равно это мелочи. Ещё раз огромное спасибо! От модератора: а може напишете більш літературною українською мовою?) Без шифрувань під спамерів. Бо якось складно зрозуміти, що ви намагалися написати. От модератора: какие игры, от какого издателя, на каком языке, с каким расширением файлы субтитров и озвучки, имя исполняемого файла игры? Привет! Мне кажется, у меня похожая проблема. Очень захотелось поиграть в ФК, наткнулся на ваш крутецкий сайт, все скачал, вроде все понятно написано,ага, но вот запустил вашу прогу и как-то не могу я настроить игру. Добавил игру вручную, при настройках игры в строке «выберите экземпляр игры» ничего не находится, в итоге при настройке, конечно, файл hp.uni сохраняется вообще где-то в документах, и игра , соотвественно, по-прежнему плохо идет. Объясните мне, что делать. Вручную этого всего не хотелось делать, так как не без особых знаний что-то менять сложно. И еще, как изменить расположение самой игротеки, а то она у меня находится в несуществующей папке C:/Windows/my secrets ; ). Я думаю, само ее расположение и название предполагает изменение этого пути, но я никак не могу это сделать.